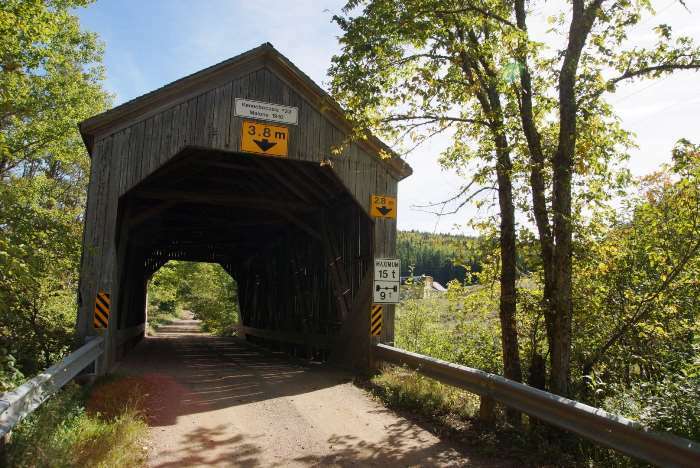 There are dozens of covered bridges throughout New Brunswick. You can find one of them on a short detour off of the road to Fundy National Park. The Malone Bridge, also known as the Kennebecasis River Bridge, is still in good condition, and driveable. To find the Malone Covered Bridge, head south from New Brunswick 1 on Route 114. Watch for Goshen Road (or a covered bridge sign) and turn left. It’s about 7 kilometers down the dirt road. As I was headed down New Brunswick Route 114, I was planning on making a straight line towards the Fundy coast. After all, I had a long way to drive on this day — all the way to Halifax. But then I saw a sign by the side of the road pointing towards a covered bridge, about 7 kilometers away. Once I converted kilometers to miles in my head, I decided that wasn’t too far to drive, so I took the detour. At the very end of September, this road was starting to show some splashes of fall colors. It probably would have been even better in about a week. Along the way, I was hoping some of those colorful trees would be positioned photogenically around the covered bridge. The Malone Covered bridge was built in 1911. It’s 64 feet long, and it was constructed using a Howe truss design — just in case you’re interested in such things. For an old bridge, it’s in pretty good shape. You can walk across it and drive across it without worry. You can also make your way down to the edge of the Kennebecasis River (really just a creek at this point) for a different angle on the bridge. Unfortunately, none of those trees were changing color during my visit. Your best bet for fall colors would probably be around mid-October, assuming 2016 was an average year. Just beyond the covered bridge, there’s a beautiful old barn at the edge of some farmland. If you kept going on this road, you could eventually loop back to Highway 1 — but that’s in the opposite direction of the Fundy coast. So, I backtracked to Highway 114, to continue my drive towards the park. The short drive out to the Malone Covered Bridge will only take a few minutes out of your schedule. It’s a nice scenic detour that, quite honestly, was more interesting than anything I saw while driving through Fundy National Park. So, it’s worth the time.